Instead of a thousand words, I take a photograph. It tells a story by distilling an idea into one frozen moment in time. It is direct, unchanging and undiluted. Photographs capture the spontaneous – life as it happens. But photographs can tell another story – a deliberate and compelling idea. This is photography as theatre. It leaves nothing to chance. It is deliberate and planned in every visual detail. It is the staging of a photograph in the same way a film or theatre production constructs and stages a scene to tell a story. There are some interesting photographs of Stalin with those who worked for him. As they fell out of favour they simply disappeared from photographs in which they had originally been present. No record of them must remain. It was as if these people had never existed. I felt in small way I should tell their story. This was the reason for Revisionism. It is part of a series that will be called “The –ISM- Collection.” Originally Revisionism was conceived as a single raw looking photograph to mimic those from the 30’s. The first in what is now a series of three. The man holding the erased portrait in the first picture is the son of Soviet dissidents. The photograph in his hands is of a man who was executed in the Soviet purges. In the second photograph, the man holding the victim’s picture becomes a victim himself. 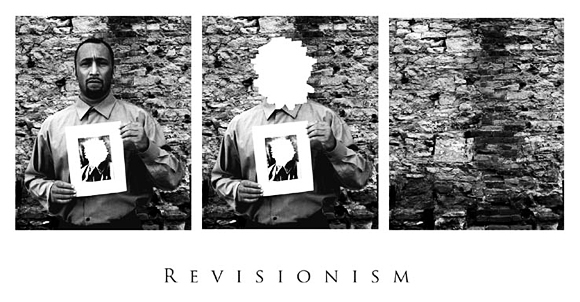 The third photograph completes the work of the revisionist. Any record that they ever existed disappears. For obvious reasons, the idea of revisionism translates well into photographic form. Unfortunately, this cannot be said for many abstract ideas. This is the challenge of photography as theatre. Constructing an image to capture a complex idea, in a clear and concise way, can be a daunting process. When it works, photography as theatre has a power that an incidental, spontaneous image cannot. The passive art of photography as record keeper, as a witness to history is replaced. It is not a matter of documenting a moment in time. It is a matter of creating it. It is taking a thought, an idea in the mind’s eye and giving it a vision that everyone can see.